Microsoft Teams may be part of the Microsoft ecosystem of apps and services, but that doesn’t mean Office won’t enjoy a cozy relationship with anyone else. 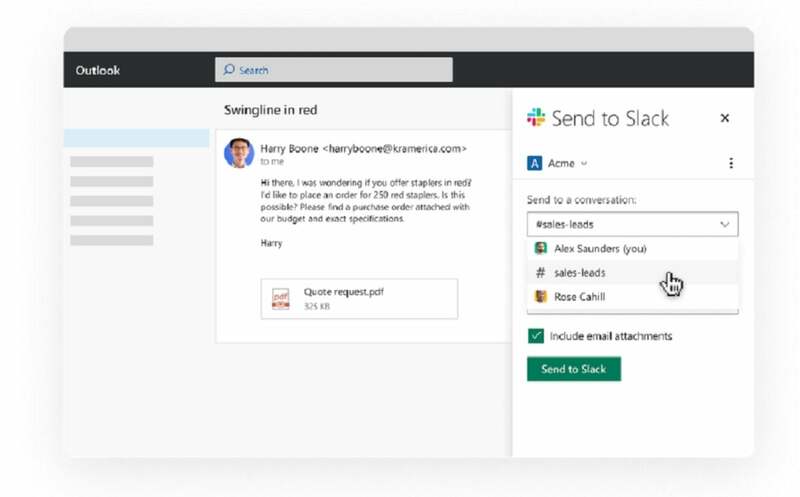 Slack said Tuesday that it, too, has integrated extensive Office 365 support, offering a number of conveniences for long-time Slack users. 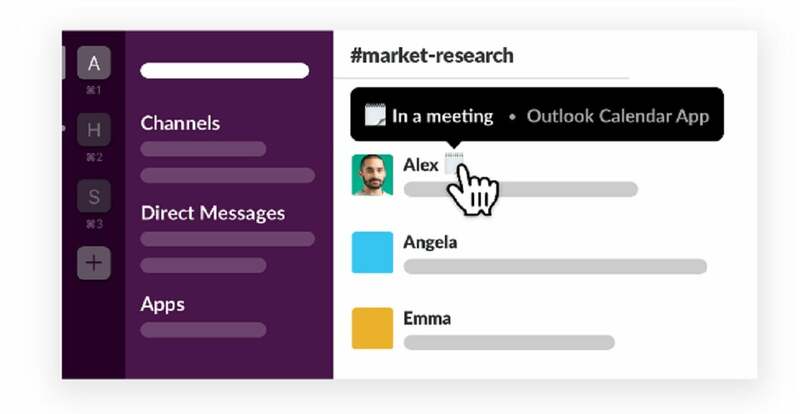 The Office 365-Slack integration will be available within Slack’s App Directory, according to a company spokesperson, where various Office 365 app connectors will be found. Users on Slack’s free plan can have up to 10 apps installed, while all of its paid plans offer unlimited app usage. Oddly enough, the handiest feature might be automatically assigning “in a meeting” status to your Slack status when you actually join a meeting. While you can manually change your status, of course, how many of us actually remember to do it? If you habitually forget to change your status, this will be a godsend for Slack users. The common thread here seems to be that Slack wants to be the platform that you’re working in, rather than Windows or Office. 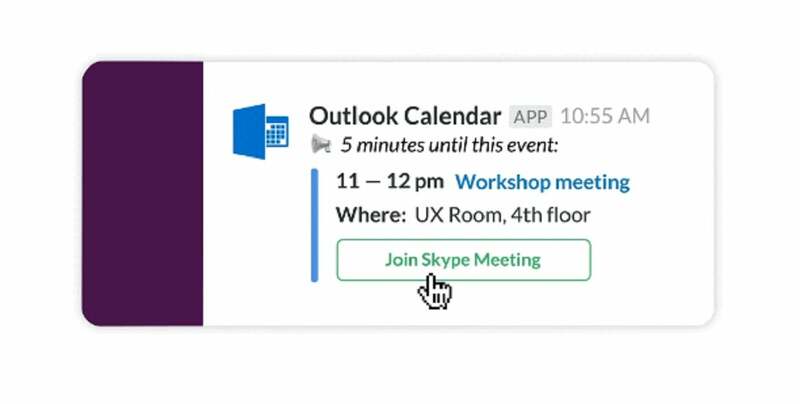 Case in point: the new apps and connectors actually reproduce the functionality found elsewhere within Windows and Office, such as the ability to tell Outlook to send meeting reminders and even a Skype link directly to a Slack channel. That same Skype link will typically appear in the scheduled Outlook appointment, which you can access via the notification Windows will send you. If you’re distracted and miss the sliding notification that Windows sends, however, a notification in your Slack channel may be a handy way to track it down. This could be handy, depending on whether or not Slack is smart enough to surface this reminder in the Slack chat room you’re currently in. Likewise, you could take an email question and shuffle it throughout Outlook, along with comments and questions to other members of your team. But Slack now allows you to send an email directly to a Slack channel, allowing the team to comment and decide how to proceed. Along with the other new Slack-Office 365 integrations, this will either be useful or redundant, depending on your perspective. Slack would prefer you share email within Slack than, well, Outlook. Where Office 365 and Teams may have an advantage, however, is still collaboration. You can share a link to a particular Office file with your coworkers within Slack, but they’ll just be able to preview it within Slack, Slack said, rather than jointly collaborate and edit it. What this means for you: If you use Slack at work, you’ll want to put this story in front of your administrator. Each Slack group has their own culture and workflow—this will be right for some, and not for others. Still, Office 365 is still the predominant office suite within Windows, and this collaboration offers users flexibility that wasn’t there before.